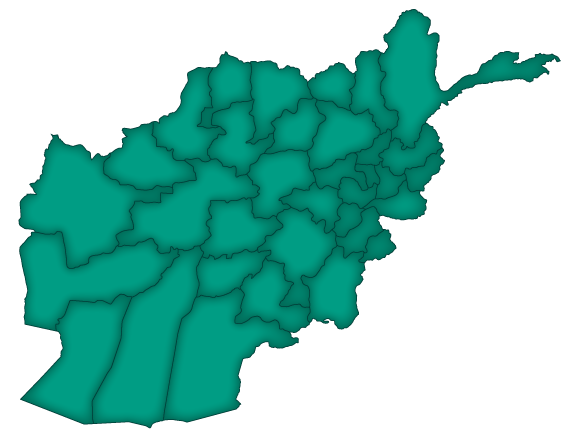 BAAG's Member organisations work across a large number of Afghanistan's provinces. Click on the provinces of the map below to see which organisations are present there and details of their programmes. Some of our members - Human Rights Watch, Amnesty International UK, Child Soldiers International and Global Witness - operate on a nation-wide basis rather than in specific provinces. MHTC Herat aims at developing the Health Clinic Resource Centre into a Mental Health Training Centre for the professional treatment of the mentally ill according to evidence based standards. It will include mental health training (theoretical and practical) of medical professionals (including involvement in psychiatric residency training for doctors, possibly specialization for mental health nursing and psychologists to become a part of multidisciplinary team). MHTC Herat will build up further, and contribute to maintaining, the mental health care capacity of the public health sector in the Western Region in order for it to provide mental health services according to the MoPH requirements. This project will be a part of the Mental Health Program of IAM (Internation Assistance Mission), supporing their plans develop in other locations in Afghanistan. The project enhances the capacity of border and transit camp staff in the identification, screening and provision of case management and psychosocial support to deported unaccompanied minors and separated children. It strengthens the collaboration between the border staff, border police and other organizations providing services to unaccompanied minors and separated children deported from Iran. War Child UK social workers working in this project will collaborate with social workers from DOLSA in Herat and Badghis. On the job training will be provided to DOLSA social workers so that when the project ends these social workers can continue to provide support with the border staff and monitor the roll out of the case management system.